The Surrey Eagles will kick-off a three game Island Division road trip on Friday evening with their lone visit of the season to Hap Parker Arena where they'll face the Powell River Kings. The match-up marks the third and final game played between the two teams this year. Surrey won the first game 3-2 in overtime on the opening day of the season, and Powell River came from behind to force a 5-5 tie in their second meeting with the Eagles in December. With six games remaining in the regular season, the Birds are firmly in control of their own destiny when it comes to winning the Mainland Division as they sit six points up on the Chilliwack Chiefs heading into this weekend's action. Surrey's magic number to lock up the division crown is seven, and two points in Powell River would go a long way towards securing first place. Joel Gaudet and Jordan Klimek have been the hottest members of the Birds of late as they both enter Friday's game on two game point streaks. Heading into Friday's game, Powell River is looking to bump a two game losing skid after falling to the Alberni Valley Bulldogs 9-1 last Friday and the West Kelowna Warriors 6-2 last Saturday. The Kings sit in fourth in the Island Division with no ability to move up or down in the standings. 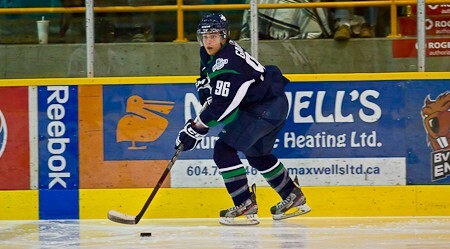 Powell River will likely face the Victoria Grizzlies in the first round of the post-season. Evan Richardson has led the way offensively for the Kings this season. The 18-year-old forward, who is headed to Boston College next year, has 38 points in 40 games.